Aberystwyth Arts Centre01970 623232work Arts CentreThe award winning Aberystwyth Arts Centre is Wales’ largest arts centre and recognised as a 'national flagship for the arts'. It has a wide-ranging artistic programme, both producing and presenting, across all art forms including drama, dance, music, visual arts, applied arts, film, new media, and community arts and is recognised as a national centre for arts development. The main concert hall at the Arts Centre is called the Great Hall and it seats over 900 people. Built in 1970, it is a very adaptable space which can be used for events as varied as live bands, sympnomy orchestra concerts, and top stand-by comedy acts, as well as conferences and for the University's examinations and Graduation Ceremonies. 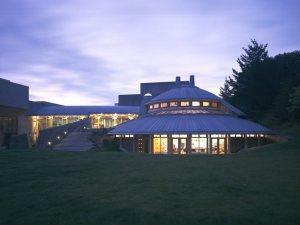 It is the main venue for concerts during the annual Musicfest - Aberystwyth International Music Festival. The Great Hall's facilities are easily adapted for conferences, lectures, and trade fairs. The award winning Aberystwyth Arts Centre is Wales’ largest arts centre and recognised as a 'national flagship for the arts'. It has a wide-ranging artistic programme, both producing and presenting, across all art forms including drama, dance, music, visual arts, applied arts, film, new media, and community arts and is recognised as a national centre for arts development. The Art's Centre is a department of Aberystwyth University, and sits at the heart of the university's campus, with stunning views over the town of Aberystwyth and along the coastline of Cardigan Bay.